Xiaomi made a name for itself by offering capable smartphones at affordable prices. The company's current entry-level offering, the Redmi 2, retails for the equivalent of around $110, but Xiaomi is reportedly aiming to beat that. The prominent Chinese manufacturer is working on a new model, and we may have been treated to a live photo of said device. The lone image reveals the back of the smartphone, and one might say that it's identical to the existing Redmi 2. The rumored specs are also quite similar and feature a 4.7-inch 720p display, single gig of RAM and 8GB of built-in storage. An 8MP/2MP camera combo will be in charge of capturing memories, and the phone will boot Android 4.4.4 KitKat. One notable difference is the chipset, where an LC1860C is being used instead of the Snapdragon 410 in the Redmi 2. The said piece of silicon is a product of Leadcore Technology which is a major Chinese manufacturer of application processors. 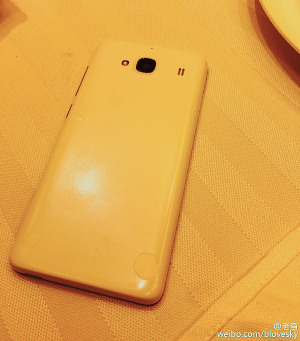 Xiaomi were allegedly targeting a CNY399 price, which translates to the rather extreme $65. At some point along the way however, that was deemed impossible and the smartphone will command a higher price, so expect a number between $65 and the Redmi 2's $110.